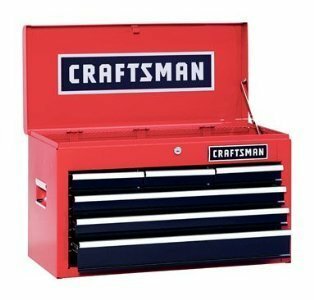 Craftsman 6 Drawer Review: Should You Buy Yay Or Nay? If you need a new tool chest, you absolutely want to check out this Craftsman 6 Drawer review. Whether you are a home hobbyist or a handyman on the go, a good tool chest is always a useful part of your arsenal. In our opinion, the Craftsman 6 Drawer Heavy Duty Top Tool Chest is one of the best around, so check it out today! The build quality of this tool chest is definitely top notch thanks to the steel build, powder coat finish, and very high weight capacity. You do get quite a bit of value for your money here. It is a slightly expensive tool chest, but it does have a great build quality and more. All in all, the Craftsman 6 Drawer Heavy Duty Top Tool Chest has a lot of storage space, especially considering what it is meant for. The Craftsman 6 Drawer Heavy Duty Top Tool Chest is fairly heavy and does not have wheels, but it does have carrying handles. The Craftsman 6 Drawer Heavy Duty Top Tool Chest is a great tool chest with lots of space, a high level of durability, and much more. The all steel construction is something that we definitely like here, not to mention the smooth gliding doors. It can be placed on top of a tool cabinet and it can be used on its own as well. Also, it is as good for home use as it is for being on the go and traveling to the jobsite. Being able to lock this thing is another big bonus too. If you are a handyman, renovator, contractor, plumber, carpenter, or home hobbyist, then the Craftsman 6 Drawer Heavy Duty Top Tool Chest is a probably a good option for you. It makes for a nice compliment to the Craftsman tool cabinet on which this item can be placed for extra storage. If you are running out of room for your tools, this bad boy might just be for you. It also makes for a good option if you are on the go a lot. No, it is not the smallest or lightest tool chest around, but it is still small enough to make in an effective jobsite toolbox. It certainly does have a lot of room. When you open the box, you get a nice 6 drawer tool chest made of durable steel. It comes in at 26" Wide x 12" Deep x 15.25" Tall and weighs just over 45 pounds. There is one large bottom drawer, 2 medium middle drawers, and 3 small drawers located on the top. The drawers are held on smooth glide bearings, plus the whole thing has a key lock system so nobody can get their fingers on your tools. 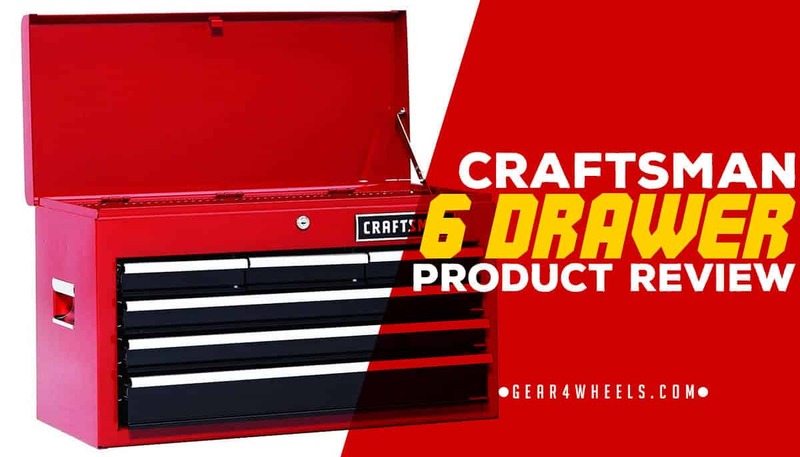 The Craftsman 6 Drawer Heavy Duty Top Tool Chest has some pretty neat features, so let’s talk about them right now. First off, this bad boy is made of solid stainless steel and has a nice powder coat finish. In other words, this particular tool chest is definitely very durable, so much so that it has a total weight capacity of 450 pounds, which is more than any tools could weigh that you could put on the inside of it. The 6 drawers in total provide you with over 3,292 cubic feet of storage space, which is quite a bit no doubt. The 3 split top drawers are ideal for small tools such as ratchet sets and screw drivers. The two medium middle drawers are great for larger tools, and the large bottom drawers is ideal for larger power tools. The top part, the chest, is also great for a number of different tools and accessories. The drawers are held on ball bearing smooth glide extension systems, which makes opening and closing them about as easy as can be. The Craftsman 6 Drawer Heavy Duty Top Tool Chest also has a keyed internal locking system, so you can secure your tools from thieving fingers. Finally, this chest also comes with recessed aluminum handles for easy carrying. Without a doubt, the Craftsman 6 Drawer Heavy Duty Top Tool Chest is a really great option to keep in the back of your mind. It has lots of space, it’s durable, and it has a bunch of other features that you might like too.